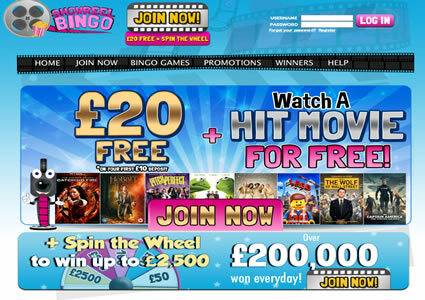 Showreel Bingo opened their virtual doors in February 2012, becoming only the second site to sign up to the 15 Network. Since then though, the network has grown in popularity and at the time of writing is made up of eleven distinct brands, all powered by the Jumpman Gaming software. These sites make a real change to the more usual Globalcom/888 Bingo or Cozy Games powered sites we see all too often and if you have not yet tried them, you really are missing out on a great time. The Showreel Bingo homepage is bright and welcoming with a blue colour scheme that contrasts nicely with their pink logo. Instead of filling the screen with loads of flashy graphics so like many sites do, they have opted for just two static banners. The large one at the top of the page is used to advertise their welcoming offers which include a decent bonus, a free movie on DVD and a Newbie Jackpot room where new players can compete for the chance to win a share of big cash prizes. Just under this you will find details of their ‘Wheel of Fortune’ where you can win even more free money with every spin. When you come to register you will find it is a straightforward procedure where you will have to enter your basic details such as your name and address and your chosen username. It is at this stage where you will be able to choose your free DVD and there is always at least a couple of options. There is no need to enter any credit card details until you are ready to play for real, but when you do they will welcome you with a decent first deposit bonus plus reload bonuses on all future deposits. Unfortunately at the moment this will need to be done via credit or debit card as they do not offer any of the secure online methods you may be used to. Head into the lobby and you will find five tabs: 90 ball, 75 ball, Jackpots, Newbies JP and Instants. Occasionally you might find extra tabs added to this line-up and this is used to promote special games such as their New Year jackpot for example. You will find a number of rooms for each game and from the lobby you can see details of the number of players taking part, the time until the next game, the price of the cards and the estimated jackpot you could be playing for. 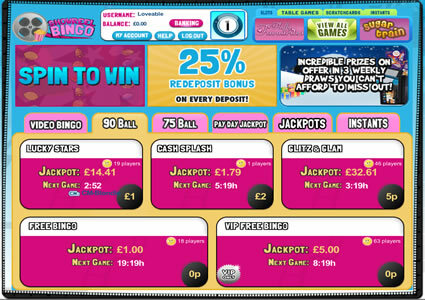 In the top right hand corner of the screen you will also find a selection of slots, table games, scratchcards and instant. The bingo rooms look great and are designed to tie in with the rest of the site. They use the same blue and pink colour scheme but this time set against a background of a film clapper and bingo balls. The left hand side of the screen is dedicated to displaying your cards and this is surrounded by a border of lights, all building upon the old time cinematic feel. 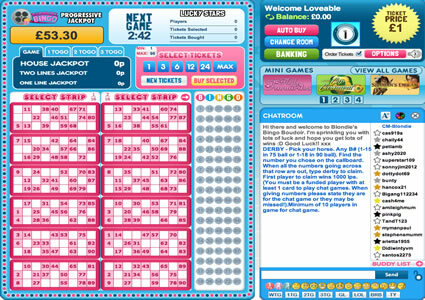 The right hand side of the screen is dedicated to the players and there is a friendly chatroom with plenty of emoticon and bingo acronyms built in, all geared towards saving you time whilst enjoy a bit of banter with your buddies. Promotions are restricted to those offered by the network but this is no bad thing as this a varied mix to suit all tastes. Each and every month they host plenty of guaranteed jackpot games, team bingo, party nights and happy hours, all aimed at boosting the fun factor. Add to this an impressive VIP Rewards scheme, regular chat games and monthly specials to mark special occasions and you can certainly see why the site has picked up a couple of awards along the way. There are more established networks out there that could learn a lot from the 15 Network. If online bingo was a movie, then Showreel Bingo would be one of the co-stars. They might not have the pulling power of the big names but they put in a solid and reliable performance that is guaranteed to leave people wanting more. Showreel Bingo has massive potential and you can see that they are trying hard to not only be one of the rising stars of the network but also the industry as a whole. It will be interesting to see how the site develops in the future and we are sure it won’t be too long before they have their name up in lights. 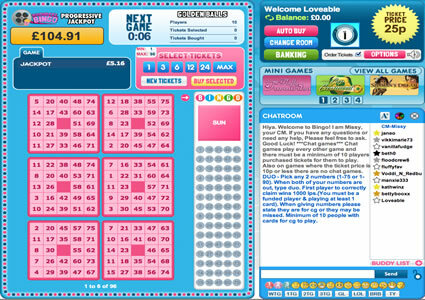 Showreel Bingo is powered by the Jumpman Gaming software which is becoming more and more popular all of the time. It provides its partners with a great range of games including 75 ball bingo, 90 ball bingo and a nice selection of side games. All of these instant games, scratchcards, slots and table games look great and combine attractive graphics with a shot of exciting features, all designed to maximise your enjoyment and of course boost your chances of winning a pocket full of cash. The actual bingo rooms are bright and colourful and extremely well designed. Click on the ‘Options’ button in the top right hand corner and you will find you have control over various aspects of the game including autodaub, alerts and the ability to see when people enter and leave rooms and their loyalty levels. You can purchase cards one at a time or by the strip to save yourself some time. In the chat room you can alter the size and colour of your font and take advantage of a selection of emoticons and buttons for the most commonly used bingo acronyms. Showreel Bingo is part of the 15 network and even though they are one of the lesser known networks out there, they are home to a good range of promotions. For a start there is an impressive welcome bonus combined with the chance to win an extra £2,500 when you Spin the Wheel. There is a decent loyalty scheme with a lot of extra benefits and even the chance to win yourself a takeaway of your choice, delivered piping hot to your front door every Friday night! Online bingo is just as much about the social side of the game as it is about winning big cash jackpots. A great way to make new friends is by taking part in the Dream Team Bingo tournaments.You just have to email in to be allocated to a team of players across the network. One way in which Showreel Bingo reward you is with Loyalty Points and these serve a dual purpose. For a start, every 1,000 Loyalty Points you accumulate can be exchanged for £1 worth of free bingo play. There are numerous ways to earn these points including taking part in the chat games run in all of the bingo rooms by the Chat hosts and also taking part in the Lucky Lotto game which plays every Wednesday night at 7pm.